Quest backup has vaulted into the Office 365 workspace. NetVault Backup 12.1 includes a plug-in that enables full and incremental backup and recovery of Office 365 Exchange Online mailboxes. Customers can back up to the cloud and on premises. They can restore individual, shared and resource mailboxes. The Office 365 plug-in provides flexible restore options and customers can restore only the data they need. Quest built the plug-in with the Microsoft Graph API. While other vendors may be using old scripting, Quest is using new technology pushed by Microsoft, said Adrian Moir, senior consultant of product management. “It allows us to grow across the Microsoft platform a lot faster,” Moir said. Quest backup customers can restore emails, attachments, contacts and calendars. Don McNaughton, vice president of sales for Quest reseller HorizonTek, said many customers are using Office 365 and need backup for the SaaS app. 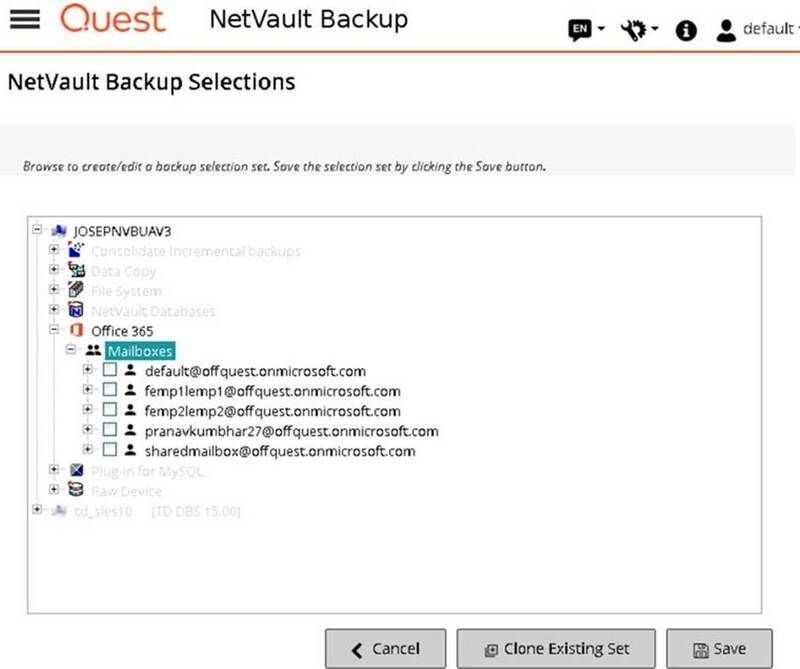 Adding the backup support enables NetVault to remain a single data protection offering for those customers on Office 365. Standout features include the full or incremental backup options, full mailbox recovery and granular recovery, he said. Some HorizonTek customers were testing out other platforms for Office 365 backup. Several vendors have come to market recently with the capability, including Veeam and Kaseya. “So the timing was good,” McNaughton said. Customers “want everything done in one place,” Moir said. That protection includes cloud and on-premises workloads, as well as hybrid approaches. The Quest backup update builds on what the vendor launched with its NetVault 12.0 release, which aimed for more enterprise adoption. Moir said he expects Quest to add more technology focused on Office 365. Competition includes some vendors purely focused on SaaS backup and others that incorporate it as part of an overall data protection platform. “It’s a crowded market. Trying to differentiate is never easy,” Moir said, adding that he feels the Quest backup product’s flexibility, API incorporation, scalability and ease of use are standouts. The NetVault Backup update also provides a multi-tenant architecture for managed service providers. In addition, an update to its VMware plug-in features vSphere 6.7 support. McNaughton said HorizonTek is still analyzing the potential benefits of the other updates to 12.1 beyond the Office 365 backup. McNaughton’s company has been a Quest partner since 2010. HorizonTek has actually been selling NetVault for about 20 years, predating when it became part of Quest backup. Quest acquired the NetVault platform from BakBone in 2010. Quest backup is on top of major trends in the industry, he said, including cloud integration and keeping everything under a single pane of glass. McNaughton said he also likes how well NetVault integrates with Quest’s new QoreStor software-defined product as well as other secondary storage platforms. Quest claims thousands of NetVault customers.